This entry was posted in Skip Allen & Painter 12 and tagged Bristly Dabs, Brush, Brush making, Corel Painter 12 Class, Corel Painter 12 Tutorial Video, Digital Art Academy, Elaina Moore-Kelly, Free Painter Brushes, Impasto Panel in Painter 12, Painter 12 Tutorial, Skip Allen, Skip Allen and Painter 12, Well Panel in Painter 12. Bookmark the permalink. Yes, finally I have thick paint that I can control and cut back into similar to a palette knife. I just need to practice using them, but as you know, my fellow instructor, classes are starting soon and I am slammed…no time for practicing. I am glad to give a nod to your classes; you are an excellent teacher. Oh no, a new bathroom door! Just when I thought Kevin was getting so much better. Sorry Kevin, but I guess it’s scary being locked in a small room…so I hope Skip will forgive you. LOVE the brushes Skip. I’ve always tried to smooth out impasto and didn’t know there was a way to do this……Thanks so much Skip. Look forward to the class !! Kevin loves you. He says you understand him, and I am a bad, bad person…sigh. The door is expensive; I think he is the bad, bad thingy or whatever he truly is. I’m looking forward to the class…do check out the latest video I posted from Tim Shelbourne; you will love it. I just got back to the blog. Funny thing, Kevin went running off somewhere acting like I caught him in the act of doing something…very strange. Anyway, what you have done with 6M sounds interesting. I can’t wait to see it. I’m hoping others will try out the brushes and get good results. Thanks Skip. Great videos. These brushes are great…so much fun! Glad you like them. I’ve been having fun with them, too. Do let me know how it goes using them. I really appreciate all that you give out free to your followers. I plan to take one of your courses in the next round. I love sharing stuff. 🙂 I am looking forward to the classes. Hope you enjoy them, too. Thank you so much for these wonderful brushes Skip. I am just now starting to play with them after finally finding the time to watch all of the videos. I hope people pay close attention to your suggestions for adjusting the settings to really get the most out of these brushes. One change that make a huge difference to me in having them behave like a real media brush is to change the angle to rotation for the art pen. Me too. It is very strange but the brush drying checkbox seems to un-check at will. 🙂 Setting pressure with brush calibration is critical with some of the brushes. I like to set the brushes to rotation, too. There are three variants that are already set to rotation. In general, I like using the art pen regardless of the setting. Can’t wait to see what you do with the brushes. Thanks for stopping by and your delightful comment about the bristly dab brushes. I enjoyed visiting your website and look forward to seeing more of your images. 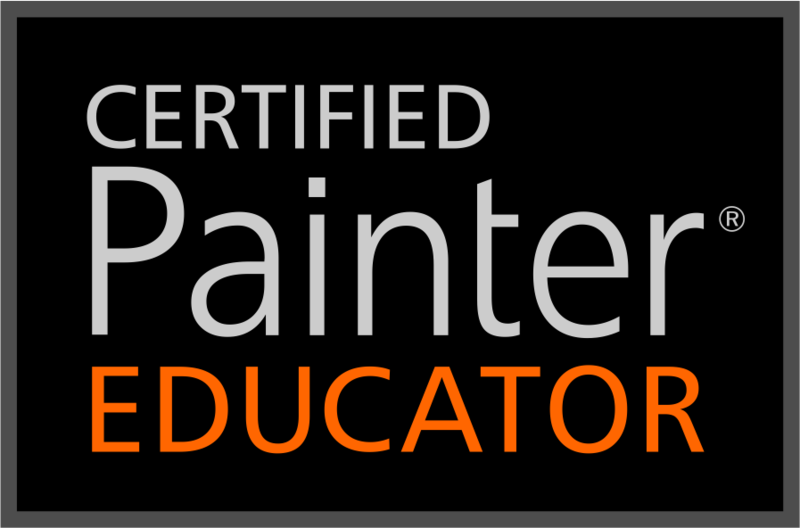 I am a fan of yours and have subscribed to your Painter 19 course beginning in July. 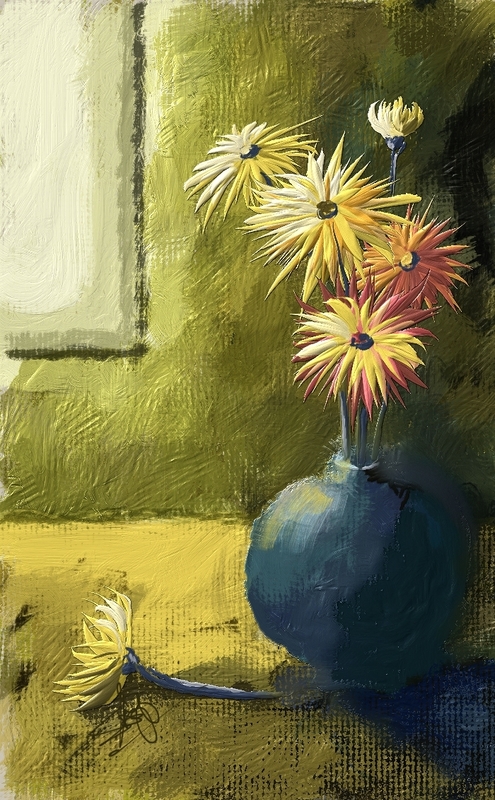 I have used your bristly dab brushes in previous versions of Painter – would these work in Painter 19?